For this blogpost it is important, that I only started working with Git so it’s possible that some facts aren’t true. But of course you are welcome to adjust me in the comments below. If you need some more help than take a look at the help side of GitHub. So let’s have a start…. Git – what do I need? As client for windows I recommend msysgit. Important tool there is Git Bash. It’s possible to install a GUI but to say the true, I didn’t get how it works and the instructions are done with the Bash. 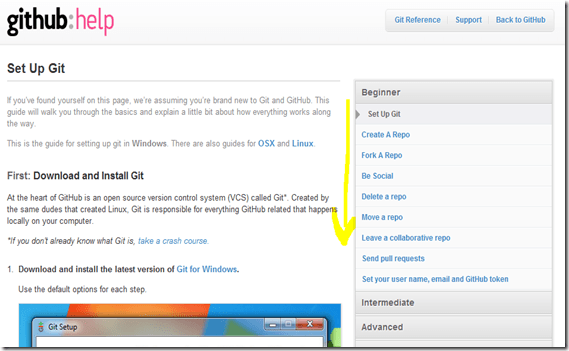 For playing around it’s a good idea to create a Repository on GitHub or Google Code (Google Code supports Git as well). I’ve created a Repository on both services and in my opinion GitHub is more elegant and offers a lot of help for beginner. First you create a folder named “BizzBingo” and after that you start the initialization with “git init”. In the folder there is a hidden “.git” folder – that’s where the mainly magic with the version administration happens. A file will be created and added via “git add.” And you da a “git commit – m ‘First’!” . Now we add it via “git remote…” to GitHub an push it at the end via “git push – u origin master”. Now it’s visible at GitHub (in the example it’s a readme file). In fact it’s not that different at Google Code. 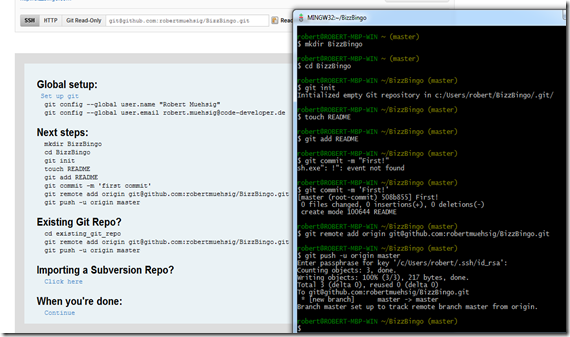 Here it starts with cloning the Repository. With this the “.git” folder will be placed in the directory. I’ve copied files into the directory. Via “git add.” All files in the directory will be added to Repository. Press “I” for the Inser-Mode and enter something now “ESC” and “:wq” I recommend you the “-m ‘Comment’” parameter.